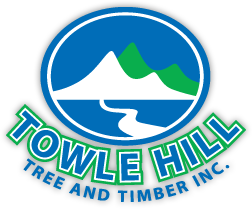 Towle Hill is your premier wholesale firewood provider for Southern New Hampshire & Massachusetts. We offer both hardwood & softwood as well as both seasoned and unseasoned firewood, always at competitive wholesale pricing & large quantities that are ready to split. Seasoned firewood has been left to dry and season over the course of at least a year. The proper splitting and stacking of the firewood will allow all of the moisture and water stored in the wood to fully evaporate. This will allow for even burning as well as produce the strongest and most effective heat. Unseasoned firewood is considered to still be “green”. This means its moisture content is over 50% and will be used inside of a year. It can be less expensive to buy and you can do the splitting and stacking yourself to save money and to insure you have some nice seasoned firewood for next year. It will not produce long lasting heat and tends to burn unevenly and, ideally, should be prepared to be seasoned. Hardwoods are your most effective type of firewood. They are extremely dense in nature yet can produce much more heat than a softwood firewood will. Hardwoods are your best bet for warmth and a burn that will last a long time. The best, and most popular, of the hardwoods are oak and maple. In addition, hardwood’s such as hickory, beech, dogwood, and ash can just as effective and long lasting. Softwoods are far less dense than the hardwoods and tend to contain more resin. They will get going much faster than the hardwoods but will not burn as long or as hot as the hardwoods will. You can combine some excellent softwoods with your hardwoods to get your fire going quickly. The hardwoods will soon take over to bring on that long lasting heat. Such popular softwood’s include pine and fir. Located in Kingston, NH, we offer both residential and commercial tree services throughout Rockingham County, New Hampshire and 'The North Shore' Massachusetts.